Former Nevada State Senator and recently elected United States Representative, Steven Alexzander Horsford was born on April 29, 1973 in Las Vegas, Nevada. Horsford became head of his household at ten years old, taking care of his younger siblings while his mother struggled with addiction and his grandmother needed constant medical care. His father was shot and killed when Horsford was 19. Horsford attended Edward W. Clark High School, and worked throughout high school at a local Pizza Hut and animal shelter. He attended the University of Nevada at Reno majoring in Political Science and Communications but left before graduating to care for of his younger siblings. Horsford married Sonya Kaye Douglass in 2000, and together they have three children, Benjamin, Bryson, and Ella. In 2001, Horsford began working at the Culinary Academy of Las Vegas where he is the current CEO. He helped create labor/management partnerships between major Las Vegas and Nevada employers such as MGM Resorts, Wynn Las Vegas, and Caesars Entertainment, and several culinary workers unions. The partnerships have been successful, and approximately half of new graduates of the Academy find employment right in Las Vegas area hotels soon after graduation. Horsford entered the Nevada state legislature in 2004 when he was elected to the Nevada Senate to represent District 4, the most racially and economically diverse district in Nevada. He was re-elected to the position in 2008, and rose through the ranks to become, at 37, Nevada’s youngest and first African American Senate Majority Leader. While in the legislature he served as chairman of the Finance Committee and the Interim Finance Committee, vice chairman of the Revenue Committee, and member of the Legislative Operations and Elections, Health and Education, and Government Affairs committees. 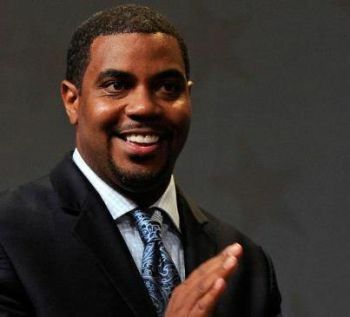 Horsford’s notable State Senate legislation includes the 2009 “Clean Energy Jobs Initiative,” tax incentives for businesses that create higher paying jobs in the state, education accountability measures, improved regulations for the state mining industry, and mediation requirements in home foreclosures. While in the Senate he opposed cuts to Medicaid and the 2012 budget proposal of Republican Governor Brian Sandoval. In 2008 Horsford was chosen to co-chair the Nevada state presidential campaign for Barack Obama. Horsford has won a number of awards for his service and achievements in congress and in the Las Vegas business and non-profit communities. In 2012, Horsford won the race for United States House of Representatives against Republican Danny Tarkanian, making him the first black congressman to represent the state of Nevada in the U.S. Congress. The election was marked by controversy over racist remarks by Tarkanian, and the revelation of Horsford’s student loan debt in the 1990s following his leaving the University of Nevada. Legislative Biography- Steven A. Horsford, 2009, Legislative Biography, Nevada. www.leg.state.nv.us;"Election 2012, Steven Horsford," Wall Street Journal, N.p., n.d. Web. 12 Dec. 2012; "About Steven," Steven Horsford, Horsford for Congress, n.d. Web. 12 Dec. 2012.